The Jupiter Inlet Lighthouse was completed and first lit on July 10, 1860. It is the oldest existing structure in Palm Beach County. The Lighthouse stands on an ancient Indian shell mound, dated around 700 AD, and is 156 feet tall with 105 steps from the base to the top. The Lighthouse itself is 108 feet high while the mound is 48 feet high. The light was produced by a first order Fresnel lens made by the Henry-Lepaute Company in Paris. The rotating lens flashes (burst of light when bulls-eye passes viewer's line of vision) is 1.2 seconds, eclipses (darkens) 6.6 seconds, flashes 1.2 seconds, eclipses 21 seconds, and then repeats the cycle. The light can be viewed approximately 20 miles out at sea. George Gordon Meade, a Lieutenant at the Bureau of Topographical Engineers and later the general who defeated Robert E. Lee at Gettysburg, designed the Jupiter Inlet Lighthouse. Work began on the mound in 1853, but slowed when the inlet filled with silt, the Third Seminole War erupted from 1855 to 1858, and the purgatory of heat, humidity, and insects bore on the workmen. After the light was lit in 1860, a group of Confederate sympathizers, including some of the Lighthouse Keepers, sneaked into the tower and removed enough of the lamp and revolving mechanism to make it unserviceable. Throughout the war, the light remained dark. After the war, sections of the lens assembly were returned, and the light once again beamed on June 28, 1866. Captain James Armour became the lighthouse keeper and would serve for forty-two years. A telegraph signal station was added to the lighthouse grounds in 1898. The original keeper's dwelling burned down in 1927. The light station was electrified in 1928 and damaged by a hurricane later that year. During the storm, the top of the tower was reported to have swayed up to 17 inches. Several windowpanes were broken at the top of the tower and one of the bulls-eyes sections of the lens was shattered. During World War II, the lighthouse was dimmed through the use of a low-wattage bulb. Several ships were sunk offshore, and the sad duty of recovering the bodies as they washed ashore fell to the Lighthouse Keepers. In 1959, the two-story Lighthouse Keeper's dwelling was torn down and new quarters were built. In 1973, the Jupiter Inlet Lighthouse was put on the National Register of Historic Places. 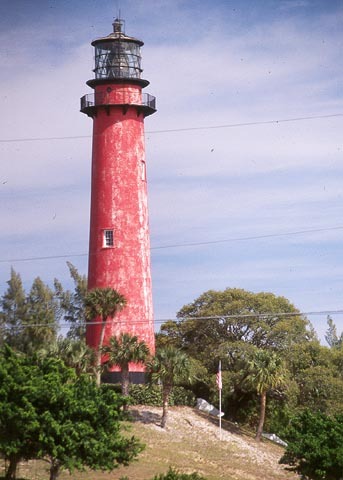 For a number of years, the Jupiter Inlet Lighthouse was painted a "firehouse" red, but during the 1999 restoration, the tower's color was returned to the natural red brick. The work on the tower took 8 months and cost $850,000. The Loxahatchee River Historical Society administers the Jupiter Inlet Lighthouse. The lighthouse is owned and maintained as an active maritime aid to navigation by the U.S. Coast Guard. Tuesday - Sunday, 10am-5pm, last lighthouse tour leaves at 4pm. $7 for adults, $5 children ages 6-18, 5 & under free. Admission includes Museum exhibits and Lighthouse Tour. From the south take Route 1 North into Jupiter. Just after A1A merges into Route 1 from the right you will cross a bridge which goes over the inlet. You should be able to see the lighthouse off to your right. Once you cross the bridge take a right and enter the park. There is plenty of parking. Even if there aren't tours to the lighthouse you might be able to sneak beyond the gate to get some shots of the lighthouse.